So, this "rainbow SG" which I was announcing last week is in fact the Gibson SG Zoot Suit which launched today. >> Check out Gibson SG Zoot Suit on sale on eBay now! I'm on a vacation this week but I had to break radio silence for this one because it is a special guitar with high "iconic guitar" potential IMO. It's not as good looking / breathtaking as I expected because I find the layers in the center are a letdown. But maybe each model is going to be unique and some will have more appeal (like the Fender Splatters). 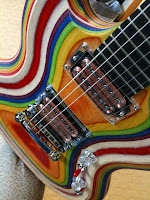 If not, Gibson still provide a choice of finishes: rainbow (at least I got that name right! ), black & red, black & natural, black & orange, red & blue. This is the most interesting part: Several layers of birch are glued together to create this unique appearance. Same is true of the neck. The pots and pickups of the Zoot Suit are transparent. What is especially cool is that the pickups trim ring and the coil forms are clear plastic because you can see the magnets and wiring of the 496R and 500T pickups. The rest is very classic Gibson USA SG hardware specs - or not far from it (like the Grover tuners). This is not a Limited Run Series apparently but it will be interesting to see for how long this will stay on Gibson's catalog. While I am not as in love as I thought I would be, I still think this is a great guitar, maybe the most exciting new offering by Gibson this year. Let's see what the actual price will be -Gibson's site has the MRSP at a wobbling $1,999. OK. Now back to my last day of vacations and a quiet evening on the porch of my Cape May rented house, downing a Corona while the evening thunderstorm passes. 1. its actual price is $1,199. Rainbow SG to be next Gibson Limited Run Series Guitar? The Gibson Lifestyle Twitter account just released this interesting picture of a rainbow-colored electric guitar which clearly looks like a Gibson SG. I am wondering if they are trying to create buzz. Like they created buzz -probably unwillingly- for the Gibson Shark Fin by keeping it a secret to this date with no picture or announcement when it is supposed to be available just one week from now. Back to this intriguing SG-like Gibson which colors look like a beautiful tribute to the Gay Pride. It seems to have transparent plastics for the knobs but most interestingly the pick ups which have no cover and display the copper wiring. This is insanely gorgeous. The controls are minimal with only a pair of volume/tone knobs and a 3-way toggle switch. The most amazing part remains the color which seems like the result of dying each vein of the wood (I'd guess maybe maple not mahogany to obtain this finish). The rosewood fretboard looks like there is no inlays. Maybe there could be dot inlays which we don't see since the pic barely shows the 16th / 17th fret. Could be that this is just a prototype. I am really eager to discover more about this exciting guitar which really reminds me of Eric Clapton's famous Fool SG and its psychedelic multicolor paintjob (notably used on Disraeli Gears). This is definitely THE Gibson I would buy right away this year because it is truly unique and will be a collectible. Maybe I'm getting over myself when this is just a pic posted through Twitter but I'll definitely check GuitarCenter.com and the Gibson Products section for leaks like the Shark Fin. Gibson Customer Appreciation Mega Sale in the Line of Fire? Not sure whether Gibson wants to offload any unsold Darkfire guitars at their Customer Appreciation Megasale. But they are under serious fire from bitter fans on their forum who are angered by the sale being held only "in the physical world" at their Nashville, TN and Memphis, TN showcase stores. Of course everybody is expecting an online sale, maybe with an auction system or at least some kind of price list to set expectations before you embark on the road trip to buy your next cheap Gibson. no pictures ,no pricing, you want me to drive to Nashville and hope to score on prices better than GC? pftttttt. What i'd like to know is the price of the guitars. I don't want to make a 3 hour trip just to find out that it is 10% off retail, so i hope that Gibson releases some more infomation soon. what good is this if I can't view and purchase any of these offerings on line? don't bother promoting such events on line when they are impractical and unreachable on line. you only succeed in disenfranchising your consumer base. fuckkkk that. I live in new jersey. I am not going out to tennessee to buy a guitar. shitt thats an extra 300 dollars for a plane ticket... do they think everyone lives in tennessee or sumtin ? Gibson should provide bus or train tickets for people who live far away and they should guarantee everything for at least five years, strings included. and they should sell everything on the internet with free shipping. and they should offer a 45 day return. and what about the list? you must have a list? If you don't comply, I'm not going and my friends aren't either. I'm not going anyway because now I'm really mad about this mega sale. BIG deal and you won't even tell me. Where is the Beef??? True believers will find a way to get to the motherstore. My bike is packed. I ride at dawn. Through the pansies and onward to the motherstore. Some people don't deserve to get a chance to take part. Some do. I do. I am a believer. I owned an original FT-79N that I got in 1969. And many others that will remain dear to me. I'll see you other believers in Nashville by Monday. The rest of you pansies......stay home........and whine! Not sure how you bike back home with an Explorer hardcase, but I like the spirit! Sometimes you see awkward eBay auctions. But recently I have noticed an increase in guitar listings with stupidly staged pictures, sometimes with (allegedly) good looking girls holding the guitar, sometimes with puppets/monsters/action figures/you-name-it. This particular posting for a vintage 1968 Gibson ES-335 tops them all as it features this guitar with both babes and space monsters. In these rough economic times, I guess it's hard to move inventory, especially for a $7,000 vintage guitar like this one. So, hats off to this vendor (the_guitars_of_godzilla ) for the creativity. You can not sell and still have a good sense of humor. By the way, GL Wilson on the Guitarz blog was pointing to a similar type of listing a few days ago... with a better looking model I have to say. NEW! Gibson Shark Fin Picture! The Gibson Shark Fin is finally showing its fin. Here is the picture of this new limited run series by Gibson USA (courtesy of Guitar Center). So, it looks like an explorer with a round cutaway in the back and a reverse headstock. It is a light metallic gray finish. I see also two humbuckers (of course it's a Gibson) with no pickup cover. No pickguard, dot inlays and a simple pair of volume/tone knobs with the control switch in between. Classic stopbar tailpiece -no bigsby for this one (unlike the last run, the Les Paul florentine cut). Good. The anonymous tips on my previous Gibson Shark Fin post were spot on. I had broke the news about this upcoming guitar back last month. Funny how the launch of this one has beek kept so secret when other limited run series guitars were announced months ahead. There is sparkling wine and red wine. And there are sparkling guitars and red guitars. I enjoy both. These two Gretsch Jet from 1955 and 1956 vintages are rock n' roll textbook examples. One is silver sparkle, one is red and they both look in great shape. the teardrop pickguard and typical knobs. the Pickups; probably DeArmond Dynasonic. Jets differ significantly from their competition in that their mahogany bodies are extensively routed, making them, in effect, semi-solids. It also makes them considerably lighter than similar guitars and adds a special resonance to the line. Gretsch lovers, I hope you're happy that I am finally covering those beautiful vintage guitars! Some are truly iconic - let me know your suggestions and favorite models in comments! This gorgeous 1968 Fender Mustang in red finish, all original with original case is going in the next 24 hours. The price is right just under $1,500. This guitar is nicely aged and has a cool vibe. Here is a chance to own a beautiful vintage Fender. Go for it! Just 2 weeks ago, I announced my guy Jeremy was starting taking orders on the Inspired By ZZ Top Billy Gibbons Les Paul Standard Reissue. The page has a lot of info about the work involved to reproduce the flamed top and the exact burst of this Les Paul and about the Seymour Duncan Pearly Gates humbuckers. The Billy Gibbons ‘Pearly Gates’ Les Paul Standard will be produced in a very limited quantity of only 350 guitars – 250 will receive Gibson Custom’s patented V.O.S. finish, 50 will be aged to look exactly like the original Pearly Gates, and another 50 will aged and personally signed and played by Gibbons himself. But don't be shy and go talk to Jeremy about your Pearly Gates. Or any other guitar. He is great. A Fire Fender Splatter - perfect for Jimi Hendrix! Quoting Jimi Hendrix: Let me stand next to your fire! is on fire with orange, yellow, red and black. Splattercasters are definitely psychedelic enough in their concept (spinning colors to create unique random patterns) and their looks that I think Jimi would have loved to set one on fire. Friends, it's on my wishlist for my upcoming birthday! It's a $400 buy-it-now guitar with good potential collectible value that will look unique and good on your guitar wall. Ending the "Sparkle Les Paul" week here at IconicGuitars. to follow on the Les Paul Special Red Sparkle and the Les Paul Custom Red Sparkle -also by the Custom Shop. Price tag is a bit high at $2,995. Had I that kind of money now, it would probably go towards a Gibson Custom Shop '58 re-issue. But still, if you want a unique guitar and this finish is your bag, you'll probably the only one out there with such a guitar! Full listing here. (not the 50's Explorer type). 80's Gibson Futuras are quite rare. Especially in that ultraviolet finish. Could it be that the upcoming Gibson Shark Fin will look like this? 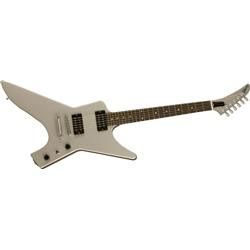 Anyway, I'm being lazy and copy/pasting the listing for this Futura guitar below. This the limited run, upscale model of the Gibson Corvus. It has a solid neck as opposed to the Corvus which has a bolt on neck. It is not to be confused with the 1950's Futura which was the precursor of the Explorer. It has a Gibson Super Tune Vibrola incorporating the Gibson TP-6 Fine Tuning Tailpiece and an ergonomic cutaway on the back. I have had this since 1988. It was customized before that with a new twin humbucker. All gold plated hardware is original. It plays very well and handles somewhere between an Explorer and an SG. UPDATE: the auction for the guitar described below has now closed. >> Search Bob Marley Les Paul guitars currently listed on eBay. I am a big fan of the Les Paul Special and its bare bone tone and appearance. It was the topic of one of my very first posts. Bob Marley's Special, which he called the "Old Faithful" is a beautiful example of the warm tone you can get through the simple mahogany wood and P-90's that make the core of the Les Paul Special. These details are captured in the reproduction of this guitar by the Gibson Custom Shop on auction. because these are pretty rare. I posted about Eric Clapton's Stratocasters painted by Graffiti artist CRASH a few weeks ago. Further collaboration between the Fender Custom Shop and CRASH led to the production of 50 Stratocasters with unique designs... + 1 for John Mayer. This is well documented by CRASH himself here. John Mayer's crashocaster! I had seen picture of this guitar in the past but here you have an original shot (by CRASH himself) of the body of this strat' when it was just naked. ...so there is no fear of burning out ideas...not yet anyway. Alder Body (1960-style routing); 21 Vintage Frets; 9.5" Fingerboard Radius; Custom Black Anodized Control Plate; Black Anodized Tremolo Cover; 3-Ply Custom Painted Pick guard; 3 Ceramic Noiseless Pickups w/Passive Circuit; Black Pickup Covers; Custom Shop Logo and Signature of Todd Krause Stamped on the Back of the Headstock (photo below); Black Knobs and Switch Tip; Vintage Tremolo; Straight-Grain Maple Neck (Custom ''V'' Shape); Special Engraved neck plate bears a seven-character Custom Shop serial number (CNXXXXX) that also appears on the Certificate of Authenticity. -Hey man, where should I put that pick up? Bridge or neck? - Dunno, buddy... Just stick it in the middle.
. Go get it tiger. It's Red Sparkle Les Paul week here. Almost. This 2009 Les Paul Custom popped in an eBay search. Just had to top yesterday's Gibson Custom Shop Les Paul Special. This one is also a rare model created by the Gibson Custom Shop. It hovers around the same price at $2,400. 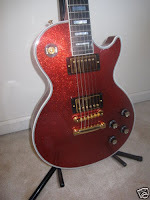 From the listing: "it has a beautiful Red Sparkle finish throughout the body, back, and neck. This one is a real beauty and rare." - I agree! Don't you think the red sparkle goes so well with the triple binding and gold hardware?